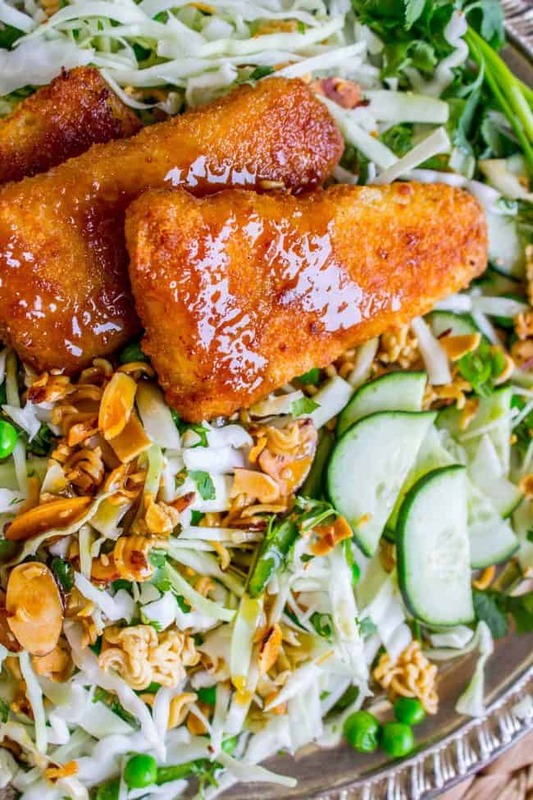 This flavorful Asian salad features shredded cabbage, green onions, cilantro and the best part of all: a crispy fish shortcut. Top it all off with a tangy dressing and a mixture of dry ramen noodles, almonds, and sesame seeds baked in butter until super crunchy. Eric and I went out for Japanese the other night. When they brought out the food, I had to ask the waiter for a fork, hanging my head in shame. Chop sticking is hard, okay?? Do you like Japanese food? Eric’s been begging me to go. I am just not into it. Sushi to me feels like I’m eating a giant eel that’s hard to chew, and all I can think while I’m chewing is, I could be eating pizza right now. I didn’t even order sushi, that’s how lame of a Japanese restaurant attendee I am. I ordered Tonkatsu on a friend’s recommendation, and I didn’t love it. I know, I know, what a lame friend, right? (Just kidding Sarah.) Sarah loves Japanese food. 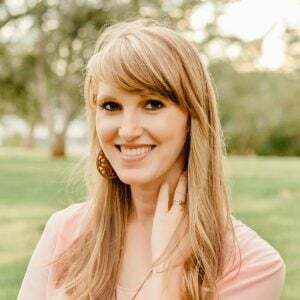 Which is perfect for her, because she just moved to Japan (for real, her husband’s in the military). What I DO know is that this salad is amazing in every single way, no matter how many forks or mini swords you use to eat it. I’ve talked before about how much I don’t love salad, but today is a huge, glorious exception. 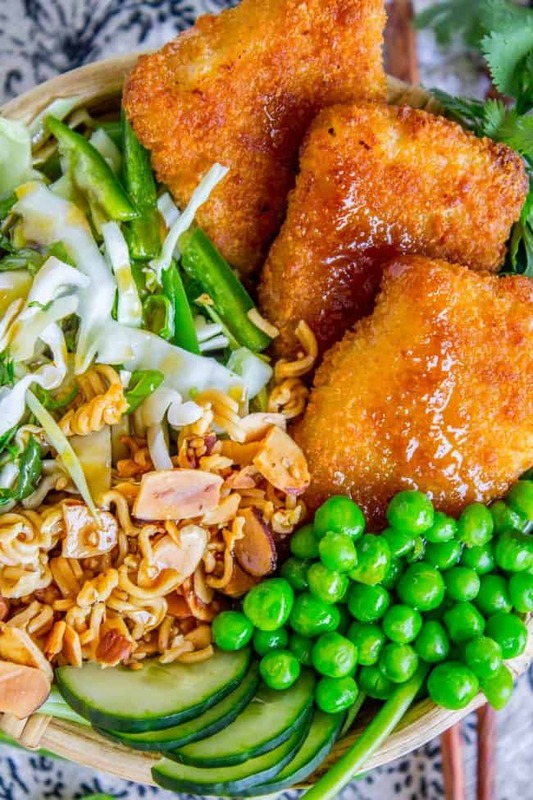 Delicious crispy fish paired with crunchy cabbage, tons of cilantro and some peas to round it out. The best part are the crunchies though. You take some dry ramen noodles, mix it with almonds and sesame seeds, and bake it in some butter. It’s sooo good and I could eat it all by itself. But it’s even better with everything all mixed together and topped with a tangy 5-ingredient dressing. Here’s a quick refresher on how to shred cabbage. You could totally buy a bag of angel hair cabbage at the store too, to make this even faster! I love using Gorton’s filets as a quick short cut for dinner. (I’m all about the shortcuts lately!) They are SO good and so fast, and an easy way to get more fish in our diet. I always have some in the freezer for last minute dinners. 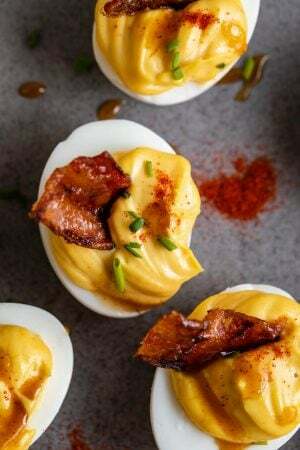 Click here and here for some other recipe ideas using Gorton’s! One year ago: My Favorite Caramel Sauce <it’s the best. 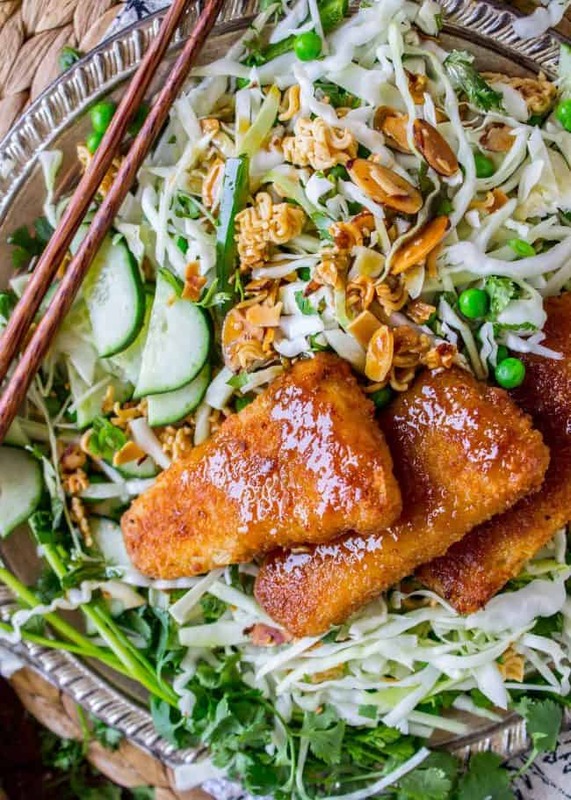 This flavorful Asian salad features shredded cabbage, green onions, cilantro and the best part of all: a crispy fish shortcut. Top it all off with a tangy dressing and a super crunchy mixture of dry ramen noodles, almonds, and sesame seeds baked in butter. Preheat your oven to 350 degrees F. Now is a good time to get the peas out of the freezer so they can thaw out. Start with the dressing: In a small pot over high heat, stir together the apple cider vinegar, olive oil, sugar, and soy sauce. Once the mixture has come to a boil, cook for about 30 seconds until the sugar has dissolved. Add the minced ginger and then remove from heat. Transfer to a mason jar or tight tupperware, and store in the fridge until cool. Make the crunchies: Melt the butter in the same pot you made the dressing in, or melt in a medium mixing bowl in the microwave. Use your hands to break up the ramen noodles BEFORE you open the package. You want small chunks, it shouldn't be crushed to a powder or anything. Open the package and throw away the spice packet that is usually inside. 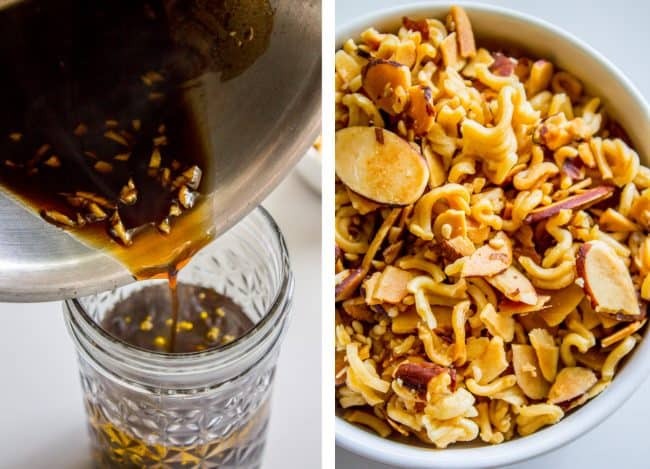 Add the dry ramen noodles, sesame seeds and almonds into the pot with the melted butter and stir. Spoon the mixture onto a baking sheet and spread out into one layer. You can line the pan with foil for easy cleanup if you want. Meanwhile, prep the salad. 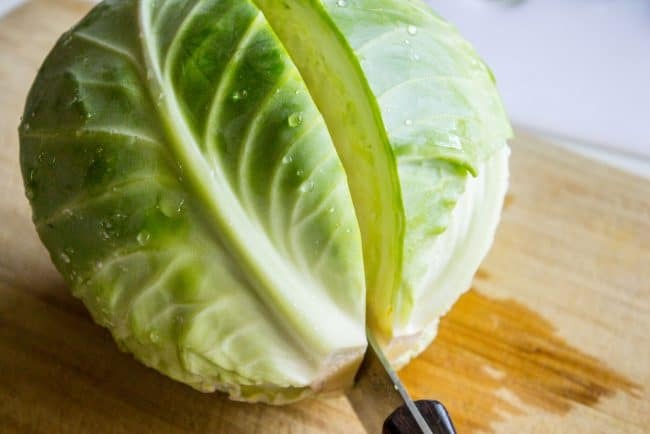 Shred the cabbage into thin strips (see photos). Chop the cilantro, green onions, jalapenos, and cucumber. Combine cabbage, cilantro, green onions, jalapenos, cucumbers, and thawed peas in a large bowl. If you are pretty confident that you will eat all of the salad right away, then toss the ramen noodles and almonds in with the salad. Toss with dressing. (You don't have to use all the dressing). 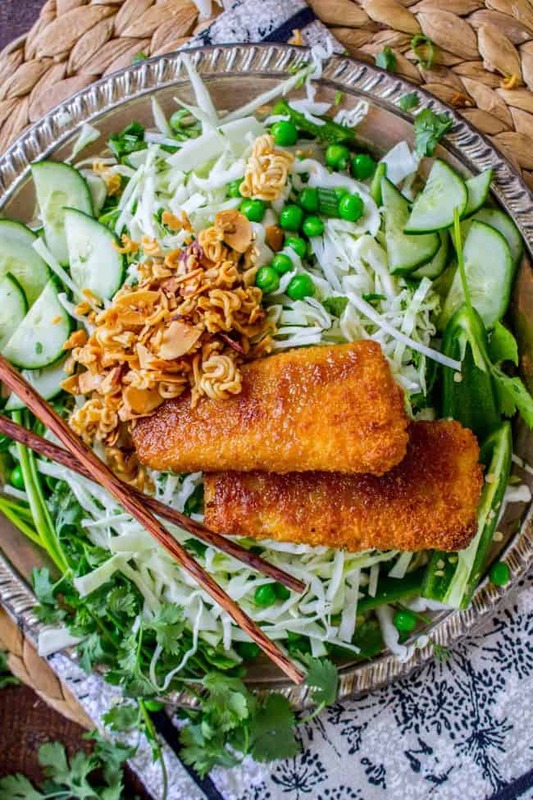 Top each plate of salad with 1-2 fish filets. Store crunchy ramen in a tupperware on the counter. Store the dressing and leftover salad in the fridge. 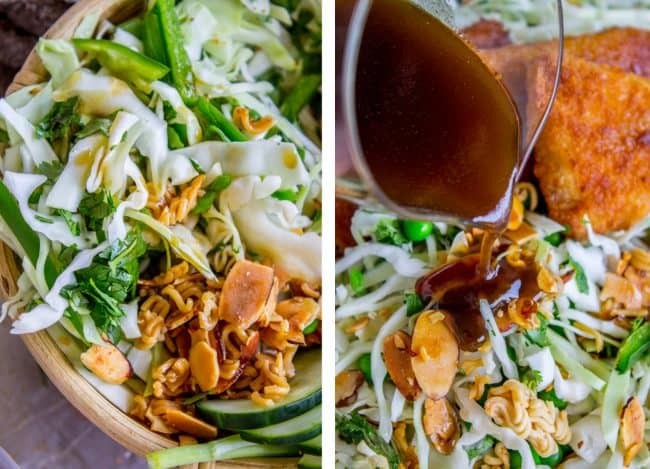 I adapted this from an old recipe that my mother-in-law gave me, Asian Cabbage Salad. This post is sponsored by Gorton’s Seafood, but all opinions are my own of course! Thanks for supporting the amazing brands that keep The Food Charlatan chugging along. You can follow Gorton’s on Facebook, Pinterest, Twitter and Instagram! 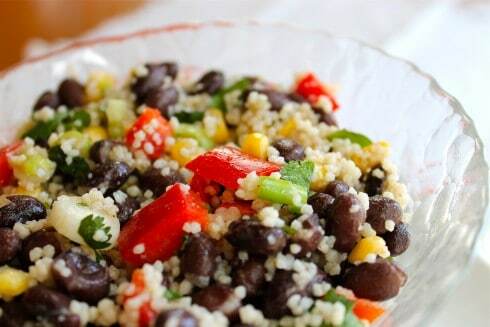 Black Bean and Couscous Salad << this would be another great salad to top with Gorton’s filets. 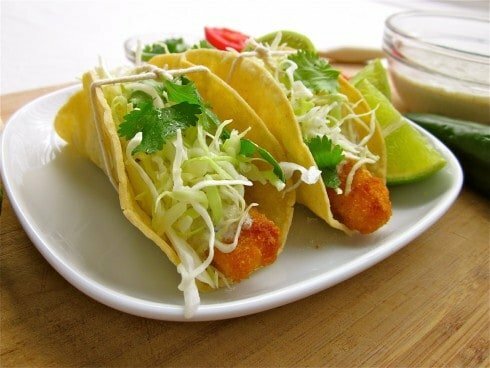 Easy Fishstick Tacos: I know these are ugly but I promise they’re delicious. I’ve been making these for years! I made this tonight to rave reviews! I came home from work and put dinner on the table in 40 minutes! This is a keeper, as we say in our family! I’m so happy to hear that Chris!! 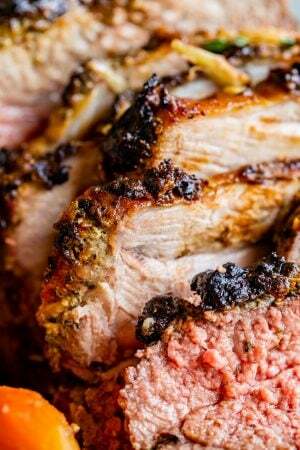 Dinner on the table in 40 minutes is a win at my house too! Thanks so much for stopping to leave a review, means so much to us food bloggers! Looks amazing! I will give you chopstick lessons someday. :D How do you feel about Chinese or Thai food? 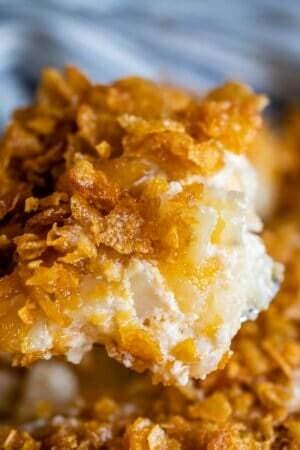 I am LOVING this idea for breaded fish fillets! 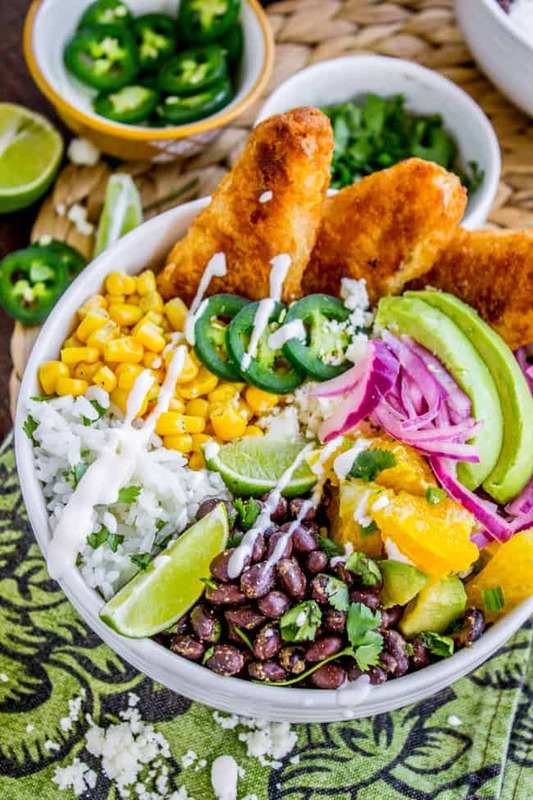 This salad is gorgeous! Thank you Anna! It’s a good quick dinner! d) another 100 points if you get this Home Alone reference which I know you will. haha! This is what I want for lunch now! Yummy! Thanks Trish! It is the perfect lunch! Absolutely love this idea! Using the Breaded Fish Fillets like this is pure genius. 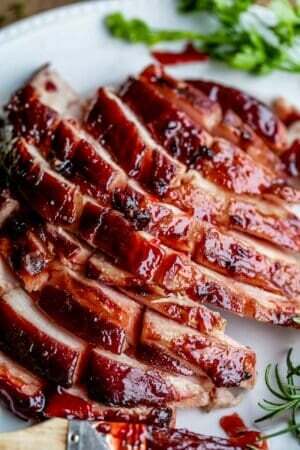 I want this for lunch!!! Me too, it’s perfect for lunch !! Thanks Dorothy, I hope you get to try it out!